We have long heard about the potential benefits of using the Wii as a means of physiotherapy, and a recent Canadian study seems to further corroborate the research. 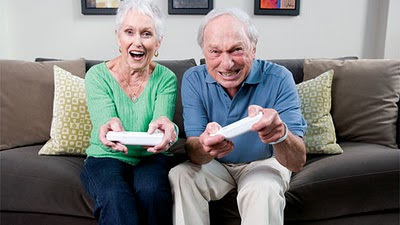 Researchers at the Toronto Rehabilitation Institute had 20 recent patients aged 41 to 83 who had suffered mild to moderate strokes play the Wii eight times, for 60 minutes each session, over a two-week period. The games played were Wii Sports (tennis) and Cooking Mama. A second group of stroke patients were asked to perform non-video game recreational activities such as building Jenga towers and playing card games. Dr. Gustavo Saposnik, Neurologist at St. Michael's Hospital in Toronto, said that patients in the Wii therapy group showed changes in fine and gross motor functions, as seen in their speed and grip strength. More significantly, the randomized Wii group experienced a seven-second difference in motor performance over the recreational group, which Saposnik described as "meaningful." Stated differently, that seven second difference means that an activity that took the Wii therapy group 20 seconds to perform, would take, on average, 27 seconds for members of the recreational activity group. The doctor cautions that these findings are preliminary and that a larger study on the effects of Wii therapy on stroke patients is already underway. I have to say, saving seven seconds on each daily activity sounds pretty impressive. Call me biased, but playing Wii is clearly more fun than playing with wood blocks. Next time somebody tells you to play Jenga you tell them you'd rather play some Boom Blox instead. And hey, if they persist, at least you'll have seven seconds to escape the situation before they notice.